I always wondered if anyone understands my drawings if I don't type anything. I went to both Shah Alam's and Publika's. 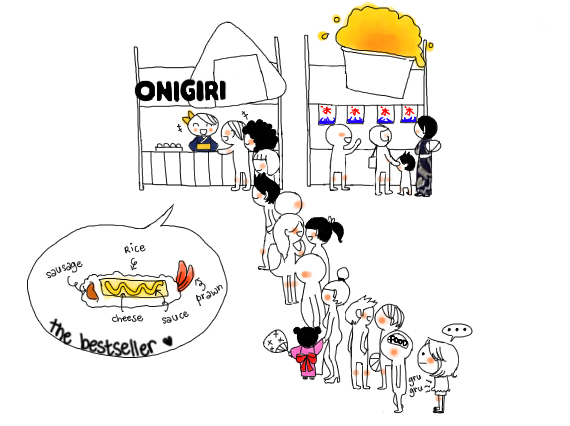 Publika's was something new and different (with all the beer drinking and watermelon seed spitting contest) but it felt more like a Summer Festival than Bon Odori. it's so cute, simple and tells so much! oh I went for the Mitama matsuri at Chiyoda-ku! you would've loved it. never been to the ones in Msia though. I'm so ashamed of myself. haha. the fella before you took away the last sausage bun thingy! 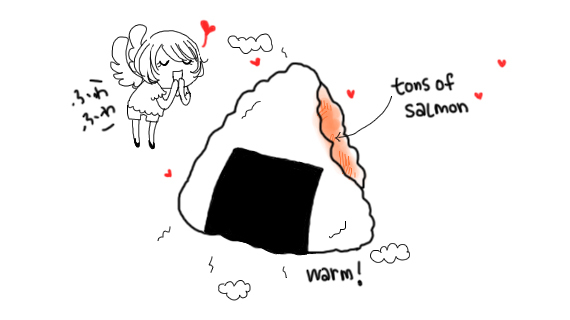 then you have no choice but onigiri with loads salmon! and yeah it's berry crowded even penang's T_T and yup the fireworks was amazing! Been to one before, long time ago. Cheryl : Kena Saman?? O_O But everyone parks everywhere! : Thank you! Will work hard! heng jean anne.17. : On the bright side, you are attending them in Japan itself! Jealous much! Constance Ant: Haha T_T thnk you for watching on behalf but nooo! I want to see! Tony Teh : ...Can't disagree on the super crowded part! I'd like to ask if you do not mind. I was curious to find out how you center yourself and clear your mind before writing. I have had a difficult time clearing my thoughts in getting my thoughts out. I truly do take pleasure in writing but it just seems like the first 10 to 15 minutes are lost simply just trying to figure out how to begin. Any suggestions or hints? Thank you!